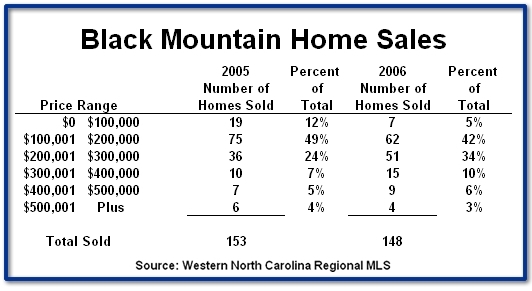 One final group of numbers that I have studied indicates that interest in land in Black Mountain continues to be very high. With volume over $14 million, land sales have increased more than 34%, but there has been only a modest price per acre increase of 4%. 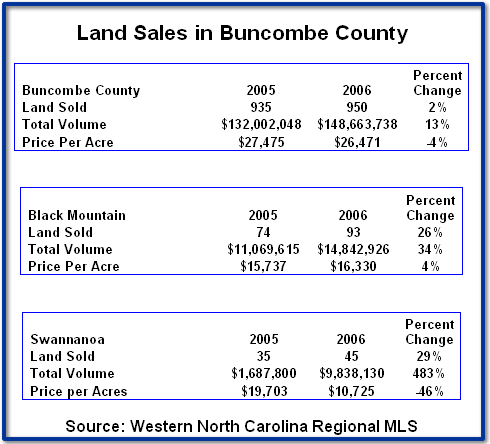 Look at those same figures within Swannanoa, and one might think that there has been a surge in volume and dramatic decrease in price per acre. A closer inspection, however, indicates that the majority of that 483% increase in volume and 46% decrease in price per acre can be attributed to a single sale of 700 acres for $6.5 million. When considering statistics as I have done this month, it is important to consider large purchases such as the one in Swannanoa, which can skew the numbers and create a one time effect on the statistics.